When Judge Yasminn Barrios announced a guilty verdict that condemned the man who played a vital role in the state-led violence that torched over 400 villages, murdered more than 100 thousand people, and displaced an excess of 1 million citizens, indigenous communities present at judicial proceedings erupted into jubilee. The once untouchable General José Enfraín Ríos Montt had been sentenced to face the rest of his life in jail. One week later, the Supreme Court of the Republic of Guatemala annulled the lower court’s guilty verdict. Shortly thereafter, Attorney General Claudia Paz y Paz, who had successfully prosecuted General Ríos Montt, was fired. The judge responsible for indicting the retired military officer had her legal credentials revoked. Most recently, the Guatemalan Congress saw it fit to pass a resolution stating that genocide never occurred in the country during the bloody civil war that lasted from 1960 to 1996. The net result of this “justice,” therefore, was a burlesque of the law and a mockery of justice. By considering the events currently unfolding in this small Central American nation, this will provide a better historic overview of the country’s tragic civil war and the cruel events that led to the brutal domestic conflict. This essay will conclude with an analysis of the Guatemalan governments tricks and the actions that are now being witnessed in the country and the attacks that are currently being mounted on basic human rights and civil liberties. During the early 1900s, Guatemala’s economic strategy was heavily influenced by European economic models, which promoted specialization based on comparative advantage. As was in vogue throughout the region, the country devoted itself to exporting agricultural resources, primarily bananas . Although the practice was relatively successful at boosting the country’s exports, the Great Depression brought the meltdown of crucial trade partnerships. By the early 20th century the sagging global economy condemned the commodity-dependent country to a period of progressive economic hardship. After the crisis somewhat abated, Guatemala was left with crippling levels of wealth disparity and unmanageable episodes of societal unrest. With the nation still reeling from the wounds of the Great Depression, the Guatemalan Liberal Party and several progressive organizations joined forces to back Jorge Ubico as their presidential candidate in the 1930 elections . The only candidate on the ballot, Ubico, was quick to enact policies upon assuming the presidency that strengthened his iron-fist control over the country. An admirer of Nazi Germany’s tactics, President Ubico established a secret police that began to systematically target those he presumed to be members of the opposition . His repressive policies invoked the outrage of the Guatemalan populace and swayed public opinion against his favor. However, due to his pro-US foreign policy, Washington’s support, and an steadfast alliance with the United Fruit Company, which controlled most of Guatemala’s agricultural production, enabled Ubico to maintain his presidency. The combination of poor living standards and President Ubico’s repressive policies continued to catalyze public unrest. The tension led nationalists throughout the country to organize in opposition to the autocratic government. By October 1944, the 13-year dictatorship of President Ubico was overthrown by a coalition of military officers, university students, and liberal college professors . In the aftermath of the revolt, ranking military officers unanimously decided to fully restore democratic rule by welcoming a civilian-led government. A decade of peace succeeded the October Revolt, known as The Ten Years of Spring. The period brought an array of liberal reforms, spearheaded by the democratically-elected governments of President Juan Jose Arévalo (1945-1951) and President Jacobo Árbenz Guzman (1951-1954). President Arévalo in particular initiated reforms that helped alleviate much of the suffering encountered by the country’s poor. Under his administration social security was established, minimum wage laws were passed, funding for education increased, and near-universal suffrage was created (illiterate woman were excluded) . The United States, the United Fruit Company, conservative military officers, and members of the Catholic Church disdained President Arévalo’s reforms, which mostly benefitted the country’s middle class. President Guzman’s Agrarian Reform, aimed at redistributing large holdings of fallow land to peasants, angered the United Fruit Company to such an extent that they began launching a campaign in order to pressure the U.S. State Department into taking action that would safe guard the investment of American citizens within the country. Pressure by the United Fruit Company eventually succeeded in 1953 with President Eisenhower approving “Operation PBSUCCESS” which outlined the CIA-backed ousting of Guatemala’s elected government . The overthrow occurred in June 1954, causing President Arbenz and his top aids to flee Guatemala after the country’s paramilitary forces toppled the government and installed Colonel Carlos Castillo Armas as the country’s strongman . Many foreign and domestic conservative groups supported the ousting of the liberal administration, even though an integral part of PBSUCCESS’ plan was the “roll-up of Communists and their collaborators,” resulting in the murder of hundreds of Guatemalans . Colonel Carlos Castillo Armas was murdered in 1958. His successor, General José Miguel Ramón Ydígoras Fuentes, classified by a CIA Chief as a “moody, almost schizophrenic individual,” governed the country with an iron fist until March of 1963 . Three years prior to his overthrow, left-wing junior military initiated a failed attempt to topple the autocratic regime of General Ydigoras Funetes . Those who survived the failed coup fled to the mountains, contacted the Castro-led Cuban government for assistance, and established an insurgency named Unidad Revolucionaria Nacional Guatemanteca (Guatemalan National Revolutionary Unity; URNG) . The URNG was able to obtain the alliance of the Soviet Union, Cuba, and Nicaragua . However, with countries such as Chile, Israel, Taiwan, and the United State’s pledging their support for the military government, the Guatemalan armed forces were quick to initiate a counterinsurgency campaign attacking leftist guerrilla bases in rural, mountainous areas . As the civil war continued, the Guatemalan military intensified its tactics in ordered to restore its grip on power. Indigenous populations, especially ethnic Mayans, were systematically imprisoned, tortured, and killed by particularly rural death squads. Although state-sponsored brutality had already terrorized and killed thousands of individuals before Enfrain Ríos Montt staged a coup, it was during his “presidency” that the civil war reached its bloodiest levels. On March 23, 1982 General Ríos Montt led a group of junior military officers in a successful coup against the government of General Romeo Lucas Garcia . Although General Lucas Garcia had the support and manpower to quell this domestic uprising, he surrendered to the dissident military officers when informed that his mother and sister were being held at gunpoint . Establishing himself as head of the junta, General Ríos Montt consolidated his role over the country by forcing two members of his junta to resign, leaving him as the country’s de facto leader of the armed forces and Ministry of Defense . 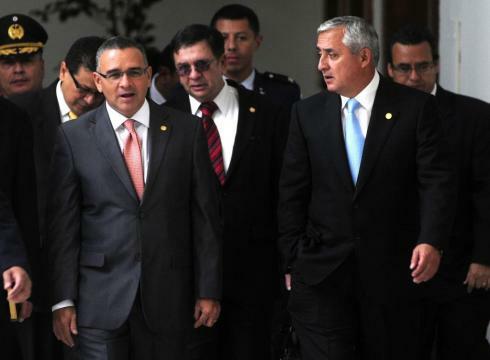 He coerced those he believed to be plotting against him, such as then commander and now president Otto Perez Molina, stating that he would have them imprisoned by presenting information implicating them of corruption. Though many hoped that the Ríos Montt led overthrow would lead to improved human rights conditions and decreased levels of corruption, it resulted in the complete opposite In April 1982, the very month he assumed power, General Ríos Montt declared a “state of siege”. He immediately moved to further restrict civil liberties, suspend the country’s constitution, and increase counterinsurgency activity in the countryside . In his first month as President of the Republic of Guatemala, General Ríos Montt is estimated to have killed approximately 3,300 people . Until the end of 1982, he presided over the systematic murder of 18 thousand citizens . Numerous killings were conducted in rural communities by civilian paramilitary groups created by none other than General Ríos Montt’s . While General Montt’s “bean or bullet” policy, which stipulated that those who supported the regime would be fed and those against it would be killed, was vicious and unscrupulous, it was successful in detaching support from the civilian population to the insurgency . In his defense, General Ríos Montt has stated that he did what he felt was best for the nation by restoring social tranquility against violent guerrilla fighters. According to him, his actions, though violent and indiscriminate, “accomplished in 17 months what had not been done in 20 years” . General Ríoss Montt was overthrown in 1983 and a stream of military-backed leaders followed after him. A combination of agreements and resolutions concluded the 36-yearlong conflict with a 1996 United Nations brokered treaty, eventually restoring democratic governance in 1999. Although some soldiers have been tried and convicted for the atrocious actions that took place between 1960 and 1996, members of the military were granted sweeping amnesty and have generally been victorious in circumventing justice. At the end of Guatemala’s civil war, 440 villages had been burned off the face of the planet . The Guatemalan state had conducted approximately 660 massacres, displaced 1.5 million people, and murdered between 150 and 200 thousand individuals. Tens of thousands of civilians remain documented as “disappeared” . Parents witnessed their children’s heads smashed into trees and husbands were forced to watch their pregnant wives violently gang raped and macheted to death by soldiers . Yet regardless of having presided over innumerable murders, rapes, and kidnappings, General Ríos Montt found himself unpunished by Guatemala’s legal system. After founding the Guatemalan Republican Front in 1989, he was elected as President of Congress in 1995. Although Nobel Peace Prize laureate Rigoberta Menchú successfully lobbied Spain’s Constitutional Court to issue an international arrest warrant against him in 2005, General Ríos Montt was able to circumvent his country’s judicial system by launching a successful congressional campaign in 2007. As a member of the legislator, he was safeguarded by the immunity granted to all elected officials . Following the expiration of his legislative term in 2012, the 82 year-old military officer was forced to appear in court. Montt’s controversial trial took place in 2013, making him the first former head of state to be tried in a civilian court for genocide. The court originally found him guilty and sentenced him to 80 years in prison. However, the victory for Guatemala’s judicial system, which prosecutes only two to three percent of those brought before it, was short-lived . A judged annulled his conviction on procedural grounds . The trial is now set to resume in January 2015, although it should be noted that President Otto Perez Molina has labeled this trial as a “threat to peace” and has insisted that this will be the last time General Ríos Montt is to be taken to court. For his part, General Ríos Montt remains adamant that, while his subordinates did commit unnecessary acts of violence, he himself did not orchestrate the systematic genocide for which he is accused . As General Ríos Montt continues to navigate his way through Guatemala’s elusive legal system, President Molina’s somewhat arrogant administration has wasted no time in erasing all traces of genocide from the country. Less than two weeks after being convicted for orchestrating the systematic murder of over 1,700 indigenous people, General Montt’s legal team was able to have his conviction annulled on procedural grounds in 2013. Following this annulment, the Guatemalan Bar Association decided to temporarily revoke Judge Yasminn Barríos’ legal credentials, inhibiting the judge from practicing law . Much like Mrs. Barríos, Attorney General Claudia Paz y Paz, who brought down General Ríos Montt and several notorious drug-trafficking criminals, soon found herself on the dark side of the judicial system. In April of 2014, Paz y Paz was removed from the approved shortlist of potential Attorney Generals. Her exclusion from the re-election bid was met with a lengthy petition of seven thousand signatures which insisted that her selection be reconsidered . Supreme Court President Jose Arturo Sierra denied the request, stating that the Guatemalan law, which stipulated that candidates with support of over five thousand people had to be reconsidered, did not apply . On May 10, the first anniversary of General Ríos Montt’s conviction, President Otto Perez Molina appointed Thelma Aldana as the country’s new Attorney General. Ms. Aldana’s appointment signaled a harsh transition backwards for human right activists. She had previously argued for the need to grant amnesty to members of the military who were instrumental in conducting the country’s state-led terror during its civil war . In a final push to assert their control over Guatemala’s history, lawmakers passed a resolution on May 14, which denied that the government had attempted genocide during the 36-yearlong conflict, a move that ridiculed those affected by the civil war. The resolution was proposed by Congressman Luis Fernando Perez, a member of General Montt’s political party, and was passed by a vote of 87 to 158 (roughly 55% approval from the legislature) . All the while, innocent activists and peasant workers continue to be persecuted by uncaught aggressors. Last year alone, 18 human rights activists were killed (more than during the countries civil war and period of authoritarian rule) . Even individuals such as President Otto Perez Molina have been implicated with committing acts against humanity, himself having been named a regional commander during the Ríos Montt dictatorship that oversaw the killing of countless people (1982 – 1983). He has also deployed troops to protests, and endorsed mega-dam projects that have the potential to destroy entire indigenous communities   . The events that have unfolded in Guatemala and are continuing to develop cannot be correlated to a singular event or the actions of a single person. The atrocities committed by the right wing dictatorships are a result of an elitist government, foreign influence, and economic conditions which have favored the rise of authoritarian rule. The success of Bolivia and Ecuador’s indigenous movement should not promote the inaccurate assumption that native people are and will forever be safeguarded from state-led brutality. Hate, discrimination, and forceful evictions against indigenous groups remain rampant throughout Latin America. Guatemala serves as the perfect case study for how a government can swiftly erase the memory of genocide and how elites can contort a nation’s judiciary and legislative systems for personal gain. Recent events demonstrate that Guatemala is opening the floodgates of authoritarianism, which once again perpetuates violence and disrespect for basic civil liberties. 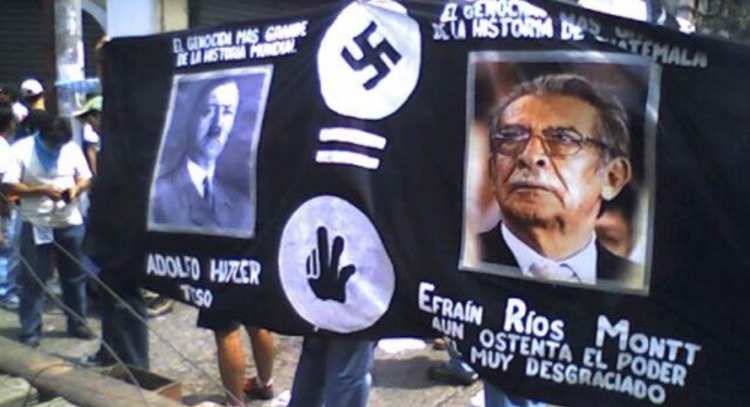 President Perez Molina’s administration, and subsequently the forces surrounding General Ríos Montt’s off-again and on-again conviction, cause fear of another genocide. Choosing to ignore the plight of indigenous people not only ensures their continued persecution, but it also paves the road for their renewed persecution. The international community’s systematic ignorance of Guatemala’s shameful pattern of governance only inflates the ego of those currently violating human rights and once again guarantees that others will do the same, both within and outside of Latin America. The fact that the death of basic rights in one country will bring on the death of the rest of them in its neighbors all but quite likely ensures the regime could spearhead the systematic erosion of liberal democratic governance and civil liberators throughout the entire Latin American region. It is unlikely that Guatemala will experience noticeable progress with regards to the overall quality of democratic governance due to high levels of corruption. After all, Guatemala is a country whose elite continually manipulates the legislative, executive, and judiciary branches in order to ensure that their past and present unlawful actions are not subjugated to public scrutiny and earnest persecution by the law. Entrenched social and political issues such as these are simply resolved overnight. But despite the grim and persistent problems that lurk in Guatemalan society, the United States should consider reevaluating its current relations with the Central American nation. If anything, the country’s transformation of the genocide from “never again” to “never happened” should serve as a catalyst for a reconsideration of aid given. After all, if the Obama administration blames the Venezuelan and Cuban government as being enemies of human rights and punishes them with sanctions, then Guatemala can in no way remain unpunished and continue to be recognized by the United States’ as its democratic counterpart. This is not to say that the State Department should withhold the $25.4 million USD in aid that sponsors various Guatemalan agricultural and developmental programs. People throughout the country, especially those housed in rural areas, already suffer from crippling levels of crime, illiteracy, violence, and wealth disparity. Trying to prevent further abusive actions by the Guatemalan government should not add to the plight of the poor. However, it is imperative that Washington thoroughly revise its military relations with Guatemala as a way to ensure that its generosity is not used to finance state-led terror and violence by the Guatemalan government. Although the U.S. State Department has been barred from assisting the Guatemalan army with monetary aid, the Defense Department continues to allocate $26 million USD for antinarcotic assistance. Additionally, while the United States deploys troops to quell drug-trafficking problems, the possibility that US military assistance is being used as a vehicle by the Pérez Molina administration to persecute Guatemalan citizens should not be dismissed. If anything, previous foreign intervention in the region should cause the international community to have greater self-awareness about the atrocities being committed in the country. Sanfirdm Victoria, Buried Secrets: Truth and Human Rights In Guatemala (New York: Palgrave Macmilan 2003), 14 – 270. Can “Nobel Prize” Rigoberta Menchú Stand Up to Guatemala’s Corruption, Military Arrogance and Self-Serving Political and Economic Elites?